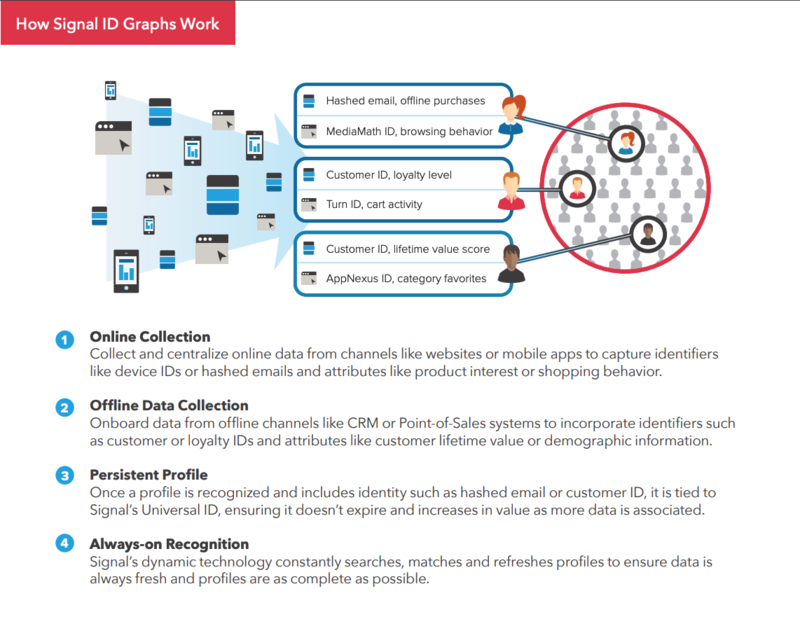 What is an Identity Graph? An identity graph, or ID graph, is a collection of known customer identifiers that can be associated with one another. Brands may have their own ID graph, or they may tap into ID graphs that have been assembled by social networks, advertising networks or onboarding providers. A single consumer has a number of identifiers—a work email address, a personal email address, a physical address, IP addresses at home and work, a mobile phone number, device identifiers from phones and computers, account usernames, an array of brand loyalty numbers, and an ever-changing number of cookies picked up in browsers. In each interaction a brand has with a consumer, one or more of these identifiers are present. To optimally engage with customers, marketers need to capture all of these identifiers and associated attributes, connect them to build comprehensive profiles and leverage them to knowingly reach a person with relevant messaging. With Signal’s Customer Identity Platform, marketers can easily collect first-party data and identifiers from all customer engagement environments—both online and offline—and stitch them together to create comprehensive customer profiles. Why Build an Identity Graph With Signal? Control of customer identity rather than rented campaign-by -campaign through third-party media and technology vendors. Data and identity are never lost when partners change. Profiles are grounded in a durable universal ID, so they don’t expire as fragile cookies are deleted. Maximized precision with entirely deterministic connections from only first-party data.